Through timeless tradition and history, the Martin Aviation vision is of a constantly improving facility, where ongoing refinements enhance Eddie Martin’s concept of a premier resource available to aircraft operators throughout the region. Martin Aviation is committed to providing a superior level of safety and service for aviators and the aircraft they fly. Eddie Martin began his flying operation at the corner of Main Street and Newport Blvd on Irvine Company property. Eddie and Johnny received their Pilot Certificates signed by Orville Wright. First hangar is obtained which had been designed by Clarence Prest in exchange for a motorcycle that was delivered by airplane. Charles Lindbergh made an unscheduled appearance at the airport to inquire how to get to the Zenith Aircraft Company in Midway City. Eddie purchases a five-place Ryan Brougham, a sister ship to Lindbergh’s Spirit of St. Louis. The airport receives its first lighting equipment & beacon from the County. Eddie Martin sells ½ of the airport to his brother Floyd and the other half to Joe Hagar his chief mechanic. Eddie takes on a personal pilot’s job and later during WWII becomes a test pilot for Lockheed. Eddie remains a frequent business advisor. The County extends South Main Street through Corona Del Mar closing Eddie Martin Airport and a new County Airport is opened. Martin Aviation is moved to the new airport but not long after, with the outbreak of WWII, all civilian flying comes to a halt and the Martin flying operation is moved to the city of Baker until the end of the war. Johnny Martin leaves his commercial flying career and returns as a partial owner of Martin Aviation. After Floyd Martin’s tragic death Johnny Martin buys out Floyd’s widow and Joe Hagar with the help of a friend to become the major owner of Martin Aviation. After 40 years of Martin family ownership, Johnny sells Martin Aviation while retaining an advisory position. After receiving a new 25 year lease for a larger site, a new facility was opened. 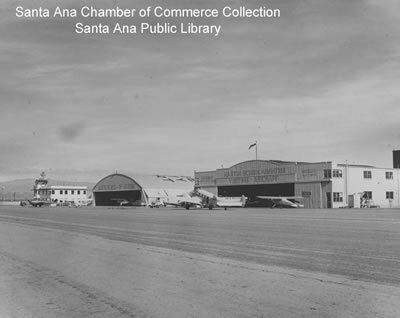 Included were quarters for flight dispatching, offices, a flight school, pilot’s supply store, 6 oversized hangars and a U shaped maintenance area that could accommodate 16 aircraft. Martin Aviation acquires more property to park and service executive aircraft. Founder Eddie Martin is on hand for the dedication ceremony. General William Lyon purchases Martin Aviation and further expands the business with property acquisitions. 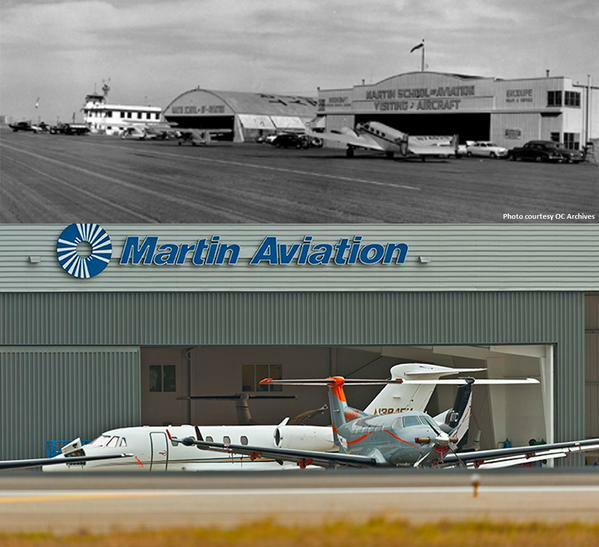 In 1996 Martin Aviation sold the Fixed Based Operation located at 19301 Campus Avenue. Signature Flight Support currently runs the operation at that location. Martin Aviation continues to exist as the primary executive aircraft repair facility at Orange County/ John Wayne Airport. During General Lyon’s ownership he starts to acquire various WWII Aircraft which are now here in Lyon Air Museum. From Eddie Martin’s Airport to Martin Aviation, Inc. Without a doubt, aviation in Orange County owes much of its prestigious image to the talent, dedication and business acumen of the one man, Edward J. (Eddie) Martin. That talent, not to mention the dedication, which was shared by his brothers, Johnny and Floyd, became the foundation for everything from the old Eddie Martin Airport to Orange County Airport and finally to Martin Aviation, Inc., the County’s oldest fixed based aviation operation. Eddie Martin’s interest in flying began when he got his first glimpse of the airplane as a teenager growing up in what was then rural Santa Ana. 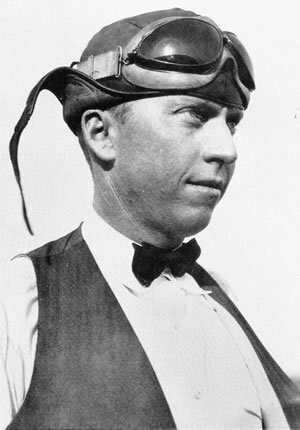 The plane was in a race with a car driven by Barney Oldfield at the old Willets track in south Santa Ana and was probably being flown by Lincoln Beachy. But Eddie didn’t get his own start in flying until 1921 when he was working as amechanic at the Santa Ana Oldsmobile dealership. The agency was sold to the Perterson family from Minnesota. A son, Tinny, had just gotten out of the Army as a flight instructor and he and a friend, Jack Colvin, bought a Lincoln Standard J-I and stored the plane at the end of West Forth Street in Santa Ana. It didn’t take long for Eddie to arrange to take flight lessons. Not long after that, Johnny found out the identity of the pilot and the owner of the plane arranged for Calhoun to meet the owner. At Eddie’s request, Calhoun agreed to swap a car for the plane, and then sold it to Eddie for $700 on terms of $75 down and $75 a month. 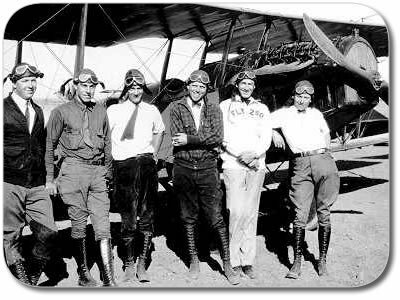 Johnny and Eddie moved the plane to the family ranch at Newport and Heil Avenues in southwest Santa Ana and Eddie began taking lessons from the pilot “Ace” Bougoneur in exchange for the Bougoneur’s continued use of the plane to give rides to the public. However, Bougoneur spent too much time flying for personal reasons and Eddie terminated the agreement. That left him with a Jenny, payments of $75 a month and no pilot. But in his characteristic quiet, confident style, Eddie had Johnny help him move the craft to a more visible location – a spot on the Irvine Ranch at South Main Street and Newport Avenue. People were excited about aviation and Eddie had no trouble attracting attention with his plane and somehow managed to get it down each time without a mishap, despite his brief series of lessons. By the end of the first weekend, Eddie had done a reasonably good business barnstorming passengers and Martin Aviation was underway.